The open and candid way in which Jimmy Carter shared his experiences brought public attention to the progress being made in cancer treatment and to the contributions made by Winship in that effort. In the summer of 2015, former President Jimmy Carter revealed that he was being treated at Winship Cancer Institute for metastatic melanoma. At the time, Carter thought he might have only weeks to live, but Winship doctors quickly developed a treatment plan for him, beginning with stereotactic radiation to control metastic tumors in his brain, and a new immunotherapy drug that worked systemically. "I don't think I ever deviated from a commitment to do what my doctors recommended," Carter told a packed press conference. 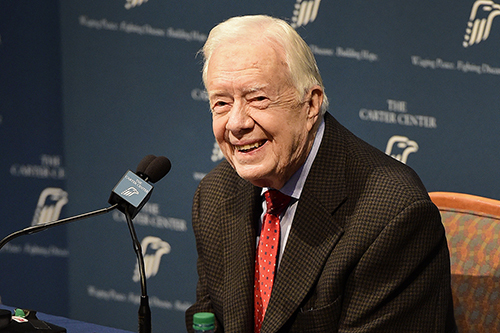 Today, Carter is thriving and still doing the humanitarian work he's known for the world over. The open and candid way in which President Carter shared his experiences brought public attention to the progress being made in cancer treatment and to the contributions made by Winship in that effort. 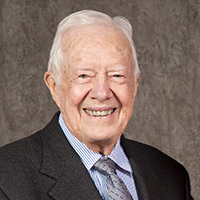 Carter has continued to raise awareness for supporting scientific research. In 2016, he supported Winship's efforts to gain comprehensive status from the National Cancer Institute, saying "It's time for Georgia to have its own comprehensive cancer center, and Winship is ready to take the lead." In the summer of 2015, former President Jimmy Carter revealed that he was being treated at Winship Cancer Institute for metastatic melanoma.